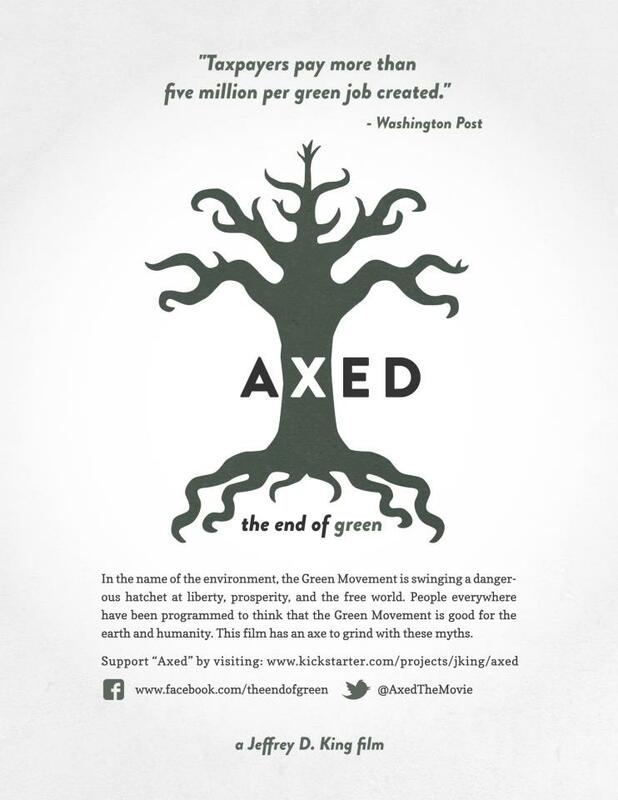 AXED is a film that Jeffrey King, a fellow conservative activist, is putting together. This is his second film, his first being the excellent Crying Wolf, which delves into the situation of the government's introduction of the Canadian Gray Wolves into the US. Jeffrey has also started a Kickstarter campaign to raise funds so that he can finish producing the movie, so if you have an interest in seeing this out there, please help him out. The green movement is something that I haven't really written about yet, but am hoping to explore with all of you at a later date. For the longest time, I've felt under attack from the green crowd. They always seem to be more intent on bashing people for using "dirty" fossil fuels than, for example, funding research for improved solar panels. I wouldn't say the green movement is entirely "evil," because lots of individuals I know tend to take a middle ground that helps the environment a little without damaging the economy, but I agree the movement's leaders at least seem to see everything in black and white. I'd say the green movement is entirely evil. They've encouraged societal humiliation for simply throwing a piece of paper in the trash can rather than the recycling bin. All they've done is complain, and they've forced other people to come up with the "green" solution. It's also a front for the Communist Party USA - green is the new red.